Rollepaal | The Rollepaal Holding Is Expanding! The Rollepaal Holding is expanding! Due to the growth of the Rollepaal Holding companies: Rollepaal B.V., Ramix Injection Moulds B.V. and Romit B.V. we proudly announce that the acquisition of a new establishment in Dedemsvaart, the Netherlands, is now completed. 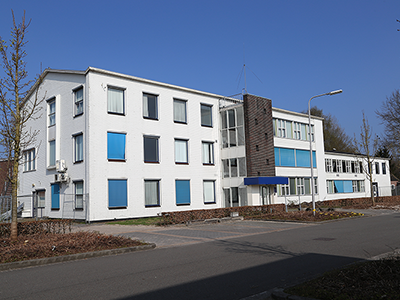 The purchase of the former Wehkamp.nl offices in Dedemsvaart is a result of our recent growth and developments within our companies. The new Rollepaal Holding offices are located only a few steps away from our current offices in Dedemsvaart and will serve as the centre of Rollepaal, Ramix and Romit activities. The current (production) facilities in Dedemsvaart will also remain intact. Due to the company growth the Rollepaal Holding currently has many new job opportunities for driven colleagues with passion for technology to join us. To accommodate new colleagues in the near future, and to make the transition to our new offices as easy as possible, various upgrades will be performed in and around the new Rollepaal Holding facility over the next couple of weeks/months. More news and updates on this to come soon. Make sure to check our website regularly for updates or follow us via social media!